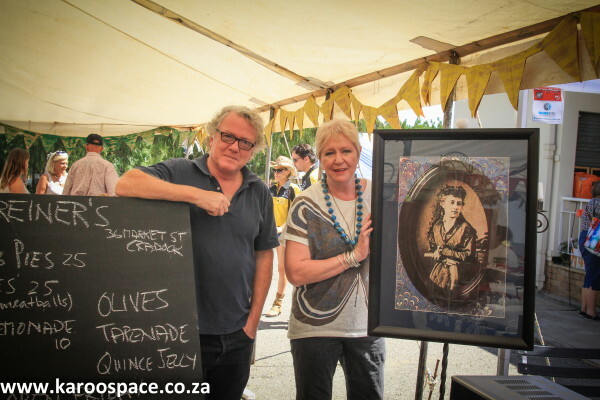 Lucia Jacobs and Louzel Lombard at the True Living stand, Karoo Food Festival. 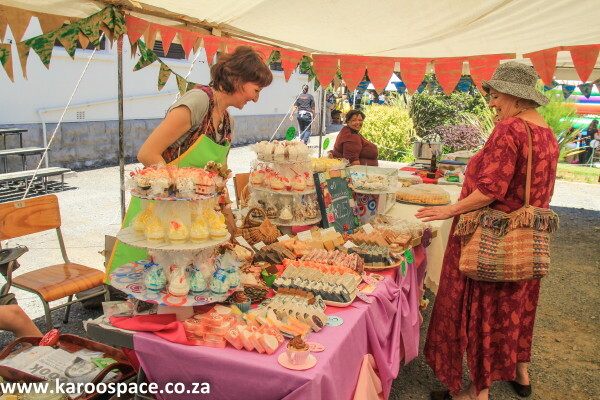 The Karoo Food Festival in Cradock is over for another year, but what a good taste it has left in the mouth. 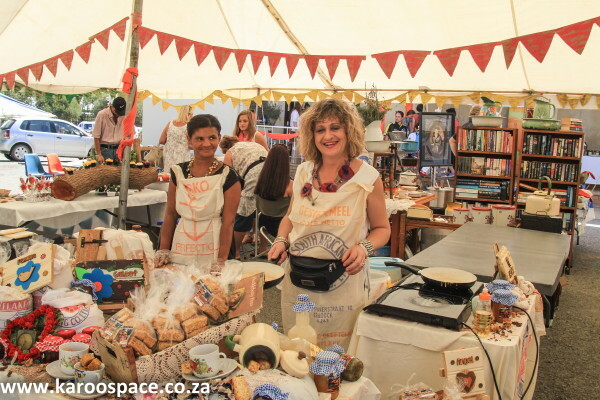 This was Cradock’s third, and the townspeople once again extended their trademark warm-heartedness, along with great ingredients and cooking skills. Each year the gathering has grown in different ways. This year’s growth came from a distinct perspective-change. City people, including small-scale food retailers and chefs, have now realised that there are some exceptional, authentic, quality food suppliers in this part of the eastern Karoo. 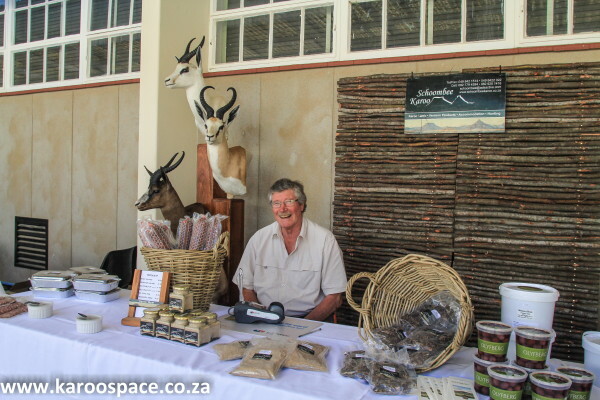 Pierre van Vuuren from Schoombee near Middelburg brought along biltong and venison salami, plus olives and olive oil. Slow food fans are finding that this region produces some of the best lamb, mutton, venison and grassfed beef in the country, as well as desert produce like quince, pomegranate and even unusual crops from the nearby Winterberg mountains – oyster mushrooms and raspberries. This year those selling Karoo produce reported that visitors frequently purchased their goods by the crate and the dozen. Artisanal distiller Roger Jorgensen remarked that his sales were up 25% on last year. 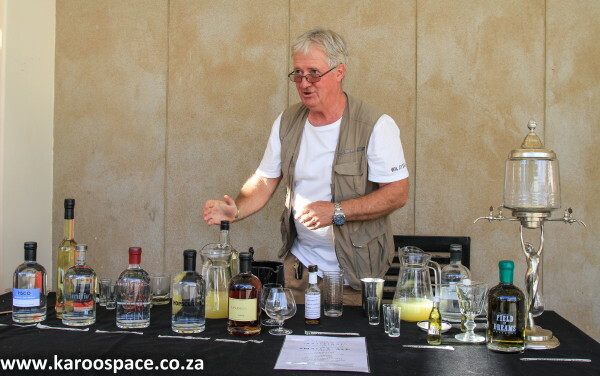 Roger Jorgensen, artisanal distiller, brought his Savignac, absinthe, SA Pisco, Primitiv Vodka and fragrant gin. Several producers also mentioned the festival had been invaluable from a networking point of view, with many finding new retail outlets. Yet the festival retains its real country feel. There was a milk tart competition (won by Cradock local Jeanette Geldenhuys). The best-looking stand was won by Toby Michau and Tracey Roelofsen of Orange Grove farm outside Cradock, bright and neat with pepper tree spices and perfect pomegranates. 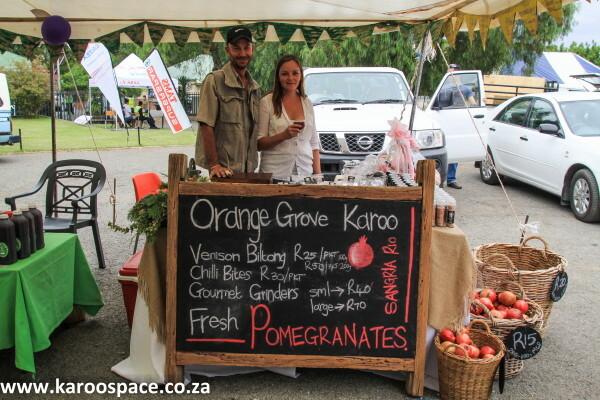 The prize for the best-looking stand went to Orange Grove Karoo, selling pepper tree spices, biltong and pomegranates. Charcuterie was really big this year, with plenty of delicious venison salamis, sausages and biltong. Tony Jackman and Di Cassere of the new Schreiner’s Bistro and Tea Room could barely keep up with the orders for their freshly grilled springbok kebabs and lamb pies. Tony Jackman and Di Cassere of Schreiner’s Bistro and Tea Room in Cradock. Cradock’s foodie dynasty, the Lombards, were also in great demand. 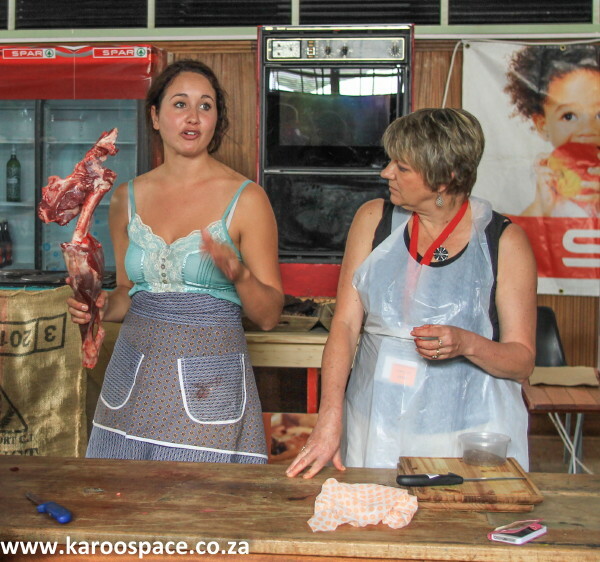 Louzel Lombard had a full class of people who came to learn from her how to make biltong at home. Then she and her mother Elanie and grandmother Dalene offered another masterclass at True Living restaurant (run by Elanie) which people raved about. Cradock local, Louzel Lombard, taught dozens how to make biltong. 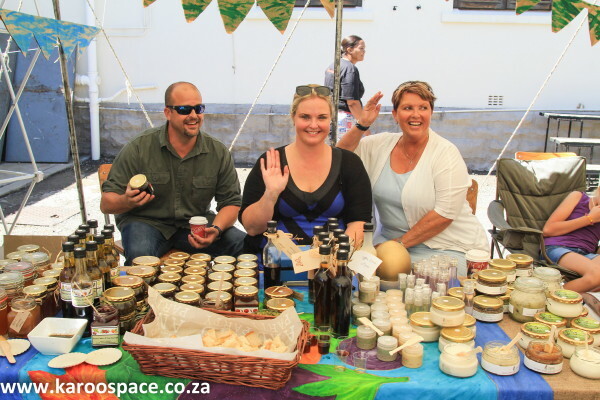 By mid afternoon on Saturday, KarooBrew coffee and craft beer had almost sold out and there were only a few crumbs left of Adrienne Southey’s exquisite lime and coconut cupcakes. 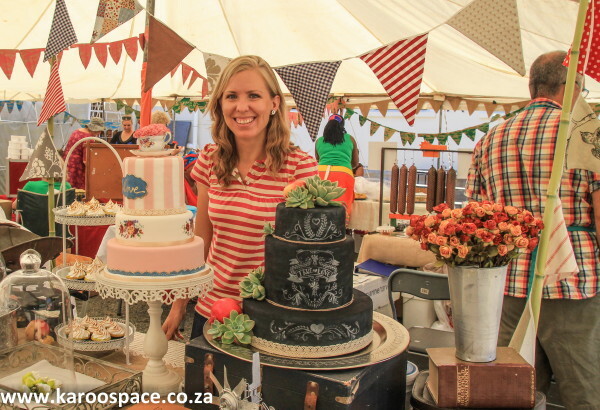 Adrienne Southey of Hillston Farm near Middelburg is a consummate baker and chef. The talks and masterclasses also did well. Former Ogilvy & Mather and FirstRand marketing expert Derek Carstens offered fascinating insights on starting his Taste of the Karoo business, and lessons he’d learnt in how to ‘scale up’ farm businesses for city consumption. 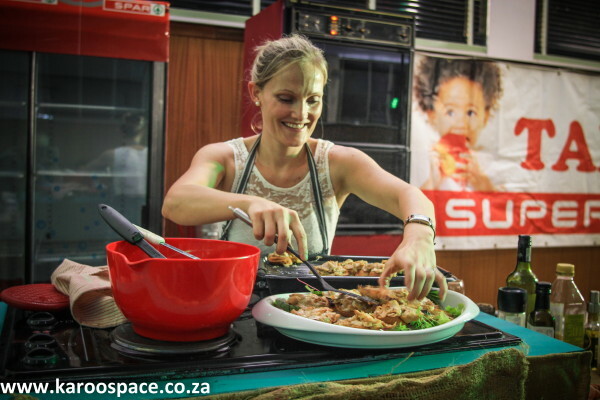 Marelise van Niekerk gave a great course on cooking with craft beer. 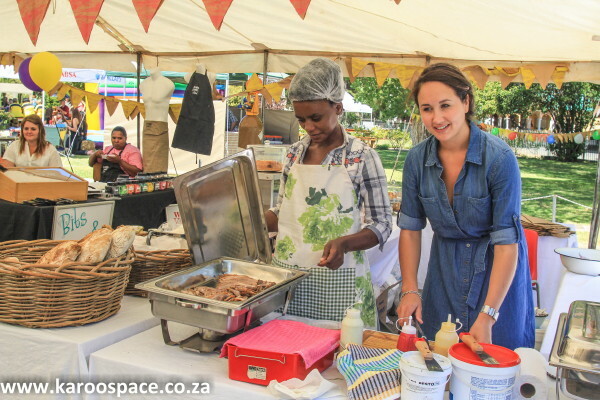 Chef Marelise van Niekerk of Bedford showcased cooking with craft beer, and along with it her warm heart, love for food and teaching skills she brought from her years as head of the Boland College Hospitality Studies (Paarl and Stellenbosch Campuses). 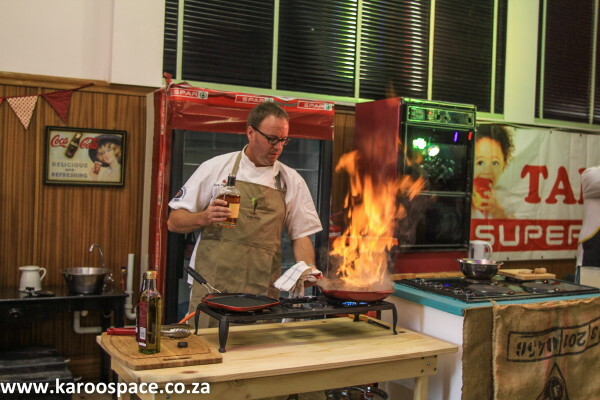 Veld to Fork ownber-chef Gordon Wright gave a lively demonstration of the best ways of working with venison and beef, which involved flambéed fillet using Jorgensen’s legendary Savignac potstill brandy and appreciating the depths of flavour in wildebeest steak compared to beef. AlgoaFM’s Charl Leslie did the smoked salmon trout salsa starter and a rather wicked dessert. Gordon Wright showed how to flambee a fillet for extra flavour. As with previous years, the Victoria Manor Hotel offered their fully booked ‘Quixotic Karoo’ evening with platteland delicacies like sheep tails, lamb shank, curried offal and ouvrou-onder-die-kombers. 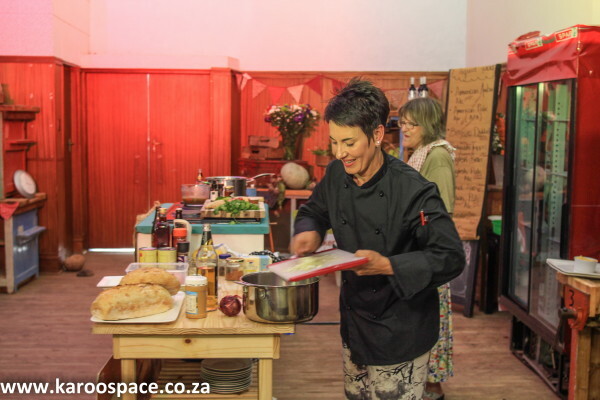 The potjiekos evening with live music was a great hit as always, but there was a new event this year – die Fees van die Baie Bokke (Feast of the Many Buck), showcasing the talents of several chefs (including Pieter de Kock of Mila’s) and local musicians. 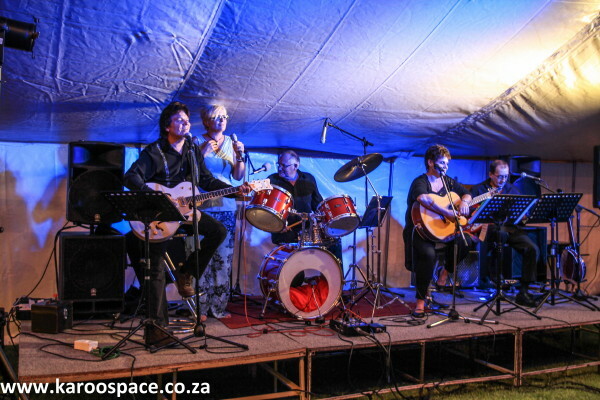 Local musicians shone at the Fees van die Baie Bokke. It was a huge success and looks set to be a regular attraction. Organisers have already set the dates for next year’s festival (18 – 21 March). And don’t forget the wonderful Bedford SoulFood Festival is just around the corner (17 – 19 April). 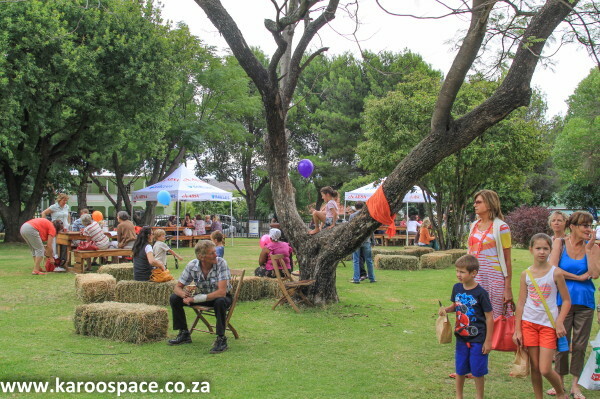 There was plenty of place to picnic on Karoo produce in the Cradock High School grounds, where most of the festival took place. Leani Loots of the Winterberg created magic with mushrooms. Penny Els and her handmade preserves and rusks. They look like cake and fudge, but these were all handmade soaps. Daniel and Angela Newton with Santa Zeiss sold out of their pestos, vinaigrettes, relishes and other delicious offerings. 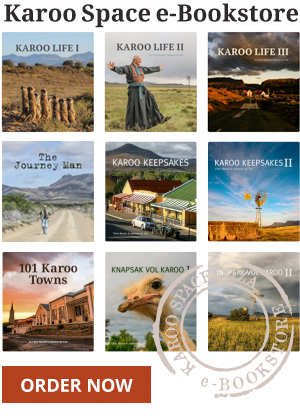 Hi Cecile – We are launching our new book Road Tripper Eastern Cape Karoo at the beginning of October. It will have a lot of the info you’re looking for in the 14-page Directory at the back. Regards, Chris M.